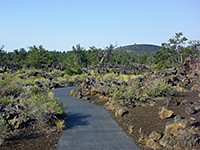 There are eight short trails in Craters of the Moon National Monument, ranging from 0.05 to 1.8 miles in length; the three most popular (all paved) are the Caves Trail, North Crater Flow Trail and Spatter Cones Trail. 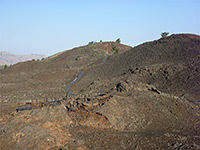 The one backcountry route is the Wilderness Trail, which follows part of the Great Rift Zone, past cinder cones, fissures and other volcanic features. The Craters of the Moon map shows the location of all trails. Broken Top Trail 1.8 (loop) 100 The loop trail around Broken Top, a tall, sparsely vegetated cone, encounters a wide variety of features including aa lava, pahoehoe lava, cinders, lava bombs, pressure ridges and lava tubes - the Buffalo Caves, which can be followed underground a little way though ceilings are low and some sections are closed. Caves Trail 0.75 level Three lava caves and a collapsed cavern (Indian Tunnel) are visited by this paved trail, most of which crosses pahoehoe lava, virtually unvegetated. The first cave (Dewdrop), beside a junction in the path, is rather small but the other two (Boy Scout and Beauty) are larger. All are open for subterranean exploration, though all visitors first need a free permit, obtainable at the entrance station. Devil's Orchard Trail 0.5 (loop) level Devil's Orchard Trail, a popular, paved route, winds through ash hills, lava outcrops (some steep-sided and quite high), and vegetated areas where bushes and limber pines have established. Interpretive notices describe some of the environmental issues affecting this fragile landscape. Inferno Cone Trail 0.2 150 Inferno Cone is a conical hill of black ash, completely lacking in vegetation, and its flattish summit may be reached by a short trail, a little more difficult than might be expected owing to the steep gradient and loose earth underfoot. 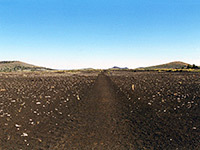 The top has panoramic views over the surrounding craters and lava flows. North Crater Flow Trail 0.3 (loop) level The shortest, and most popular trail in the national monument starts near the north end of the scenic drive, close to the campground. It loops across an area of smooth (pahoehoe) lava, passing one large lava pile and various smaller features such as ridges, blocks and squeeze-ups. Notices along the way describe some aspects of the local geology. The North Crater Flow is about 2,200 years old, one of the most recent in the area. North Crater Trail 1.8 350 This varied trail has two start points; in the north it begins by ascending a little way up the slopes of North Crater, giving good views of the campground area and park entrance, then drops down and crosses several lava flows before climbing again along one side of the (three) Big Craters. The last section descends and meets the spur road to the Spatter Cones, opposite Inferno Cone. Spatter Cones Trail 0.05 20 Although only 200 feet long, the paved trail to a group of spatter cones still has an NPS notice giving precise details of width, gradient, difficulty and other aspects. The cones are tiny craters; walls of rough, blocky lava around a central vent. Three may be inspected close up and others are visible close by, though off-trail hiking is not permitted at this location. The south end of the North Crater Trail also begins here, and this too is paved for a short distance, up to an overlook. Tree Molds Trail 1 60 At least eight tree molds, formed after trees were enclosed by flowing lava and later decayed, are reached by a mostly level trail that crosses ashen plains, quite overgrown, along the east edge of a large pahoehoe flow. Further east, the land slopes up increasingly steeply to 6,515 foot Big Cinder Cone, the highest point in the national monument. (to Echo Crater) 4 300 The Wilderness Trail starts along the southern segment of the Broken Top Trail then branches off, heading south deep into the park's backcountry along a section of the Great Rift, a 50 mile volcanic fault zone. 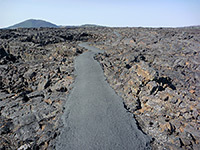 Although lightly traveled the route is wide and easy to follow, crossing flattish land covered by a mix of lava flows and ash. The path climbs slightly to a low ridge between Big Cinder Butte and Half Cone, then descends to Trench Mortar Flat, passing close to tree molds and lava cracks. It comes close to Coyote Butte, a smaller cinder cone, and arrives at the steep west side of Echo Crater after 4 miles, which is the usual destination for a day hike, though the trail continues at least another 1.5 miles to the base of the Sentinel, another conical black peak.